Back in October my husband and I did a 30 day green smoothie challenge with Simple Green Smoothies. The idea was to have you drink a green smoothie every day for 30 days. Each week they emailed you a grocery list along with four different smoothie recipes to try. When we started this challenge I had been drinking green smoothies pretty much everyday, but was excited to try out some new recipes. I learned a lot about different greens you could use to make your ‘green smoothie’ and about different add-ins to sweeten the smoothie or add protein. When the challenge was over, my husband was disappointed because he thought I was going to stop making them, I got him hooked 😉 Since then I always make sure we both start our weekday with a nice healthy refreshing green smoothie and wanted to share a few of my favorite recipes and add-ins. But if you want to try the Simple Green Smoothie Challenge for yourself, I highly suggest it. It’s FREE but they only run them every few months, the next challenge starts April 1st so sign up now here: 30-Day Green Smoothie Challenge. I made different categories on how to build the perfect smoothie, but you don’t have to choose ingredients from each category. Get creative, these are only simple suggestions and I’ll share some of my favorite recipes I use and others around the web towards the end of the post. Base: I prefer almond milk, you could also use coconut milk or water, cows milk, or coffee. Greens: Spinach is my preferred choice because you definitely don’t taste it AT ALL. I easily add one heaping cup to each of our smoothies, which is about one serving of veggies. You could also use kale, romaine lettuce, swiss chard, or avocado. Fresh or Frozen Fruit: My personal favorite fruits to use are pineapple, strawberries, blueberries, apples and bananas (not necessarily all in the same smoothie though). While doing the challenge I also loved the smoothie recipes with pears and peaches, they just involve more prep work to slice. For frozen fruit I always keep frozen mango and strawberries in my freezer. Protein: Lets be real, a smoothie with just fruit, milk, and spinach will not fill you up until lunch time, or even mid-morning. So DO NOT skip adding something from this category to your smoothie. It’s essential to add protein to help keep you full and you should be eating about 20-30 grams of protein at each meal anyway so feel free to even add two of these ingredients. You don’t need a fancy blender. While I have a Vitamix, sometimes I just blend smoothies in this Hamilton Beach blender that is a to-go cup. 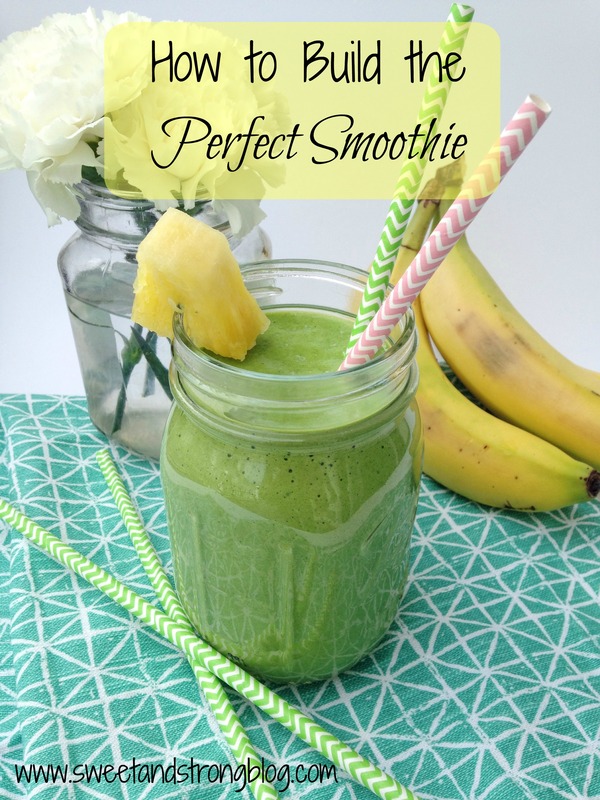 Tropical Smoothie: This recipe is typically what I make ever morning. I blend 1 cup almond milk, 1 cup spinach, 1/2 a banana, 1 cup pineapple or strawberries, 1 scoop vanilla whey protein powder, splash of coconut water, 1/4 cup frozen mango, and a few ice cubes. Blueberry: When I know I have a long morning I will blend 1 cup almond milk, 1 cup spinach, 1 banana, 1/2 cup blueberries, 1-2 tbsp almond butter, 1/2 tsp cinnamon, 1 scoop vanilla protein powder, and 3-4 ice cubes. The protein powder and almond butter help keep me full even longer. 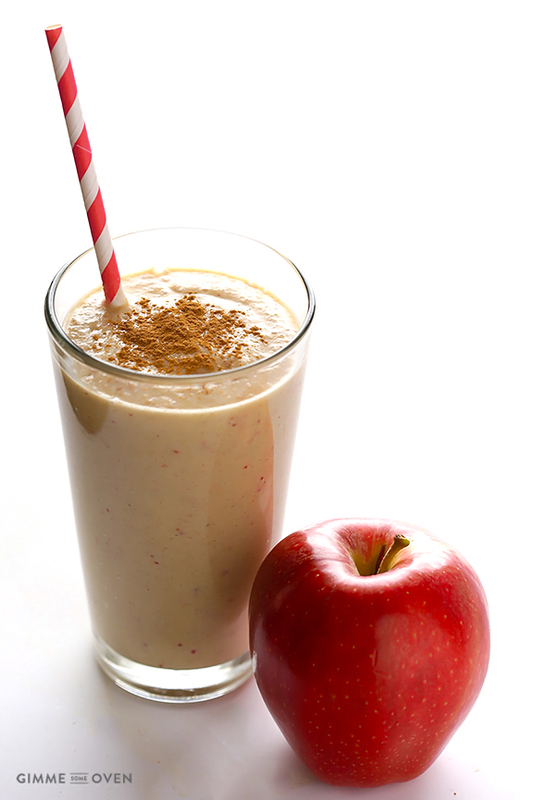 Apple Pie Smoothie by Gimme Some Oven: This is the perfect smoothie for any time of the year, but it especially has Fall flavors. I love the combo of apples and cinnamon. 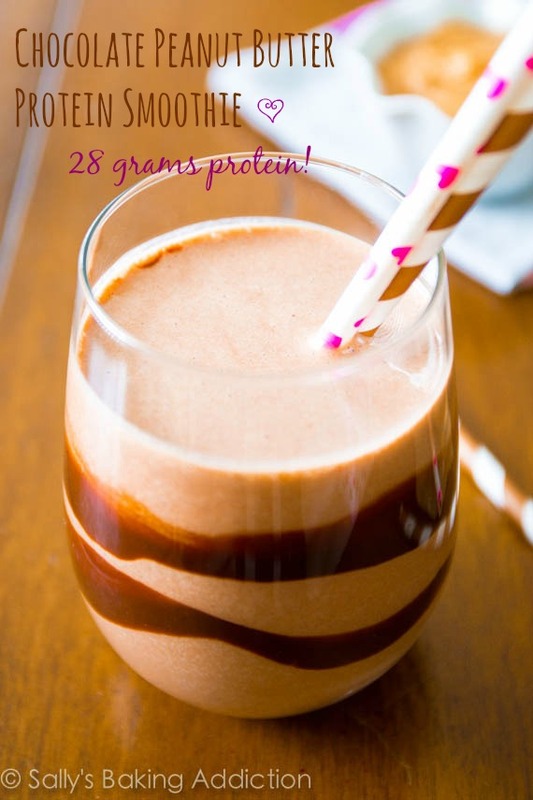 Chocolate Peanut Butter Protein Smoothie By Sally’s Baking Addiction: This smoothie seriously tastes like a peanut butter cup. Instead of the chocolate you could also add strawberries, grapes, or raspberries to make it like a PB&J. 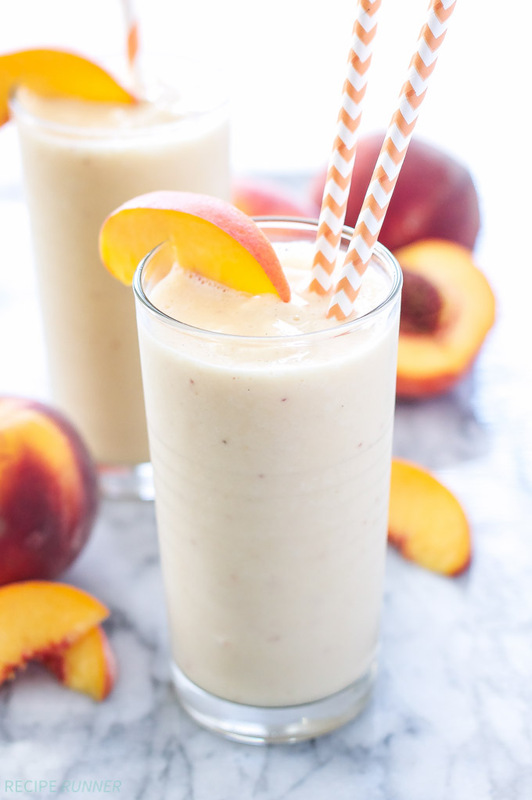 Peach Green Tea Smoothie by Recipe Runner: While doing the Green Smoothie Challenge I also used green tea as a liquid base. Since green tea has so many health benefits it’s great to add to your smoothies. 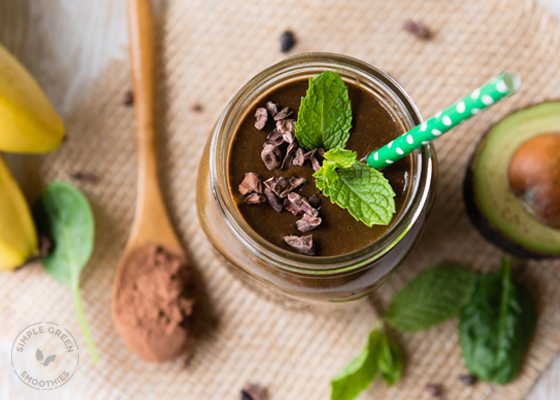 Skinny Mint Green Smoothie by Simple Green Smoothies: If you’re skeptical about adding avocado to a smoothie, try this recipe. It has mint and cocoa that all blend well. 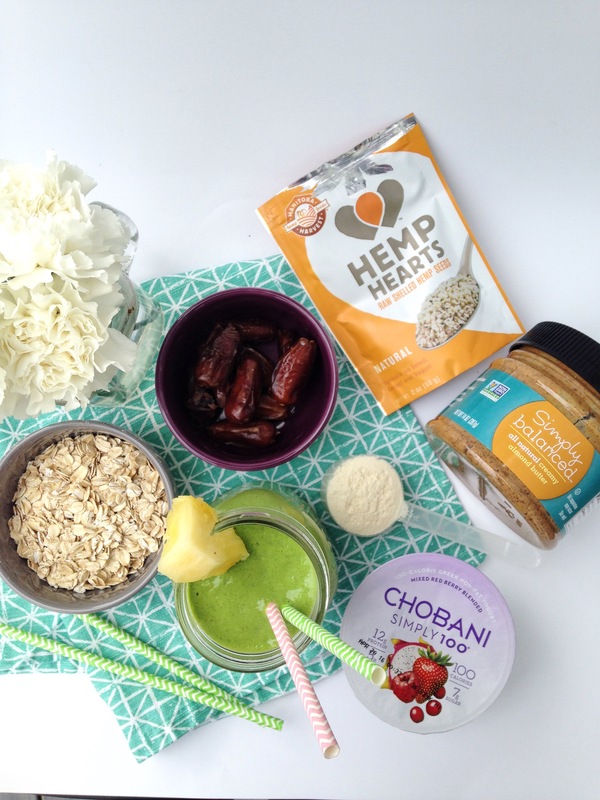 Do you have a smoothie in the morning or as a mid-afternoon pick me up? I haven’t made too many smoothies in my day but the one I made with frozen cauliflower goes down as my favorite!! I have neve tried frozen cauliflower! What a great idea! I did read about adding frozen spinach instead of fresh because it helps make the smoothie thicker. So many different ways to make them delicious! Love smoothies! I love putting sweet potatoes into my chocolate vegan shakeology smoothies with spinach and bananas. I make them extra thick then eat them with a spoon. So good!